Many of today's researchers are generating DNA sequence data for large numbers of samples in population-based experiments. This may include whole genomes, exomes, or targeted regions. 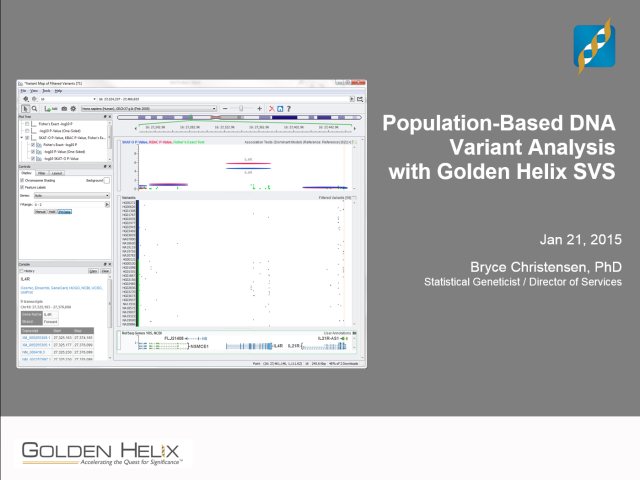 The Golden Helix SNP and Variation Suite (SVS) provides a powerful computing environment for analyzing these data and performing association tests at the gene and/or variant level. In this presentation, Dr. Christensen will review fundamentals of population-based variant analysis and demonstrate some of the tools available in SVS for analysis of both common and rare variants. The presentation will feature the recently implemented SKAT-O method, as well as other functions for annotation, visualization, quality control and statistical analysis of DNA sequence variants. Dr. Bryce Christensen fills two roles at Golden Helix as he is both the Director of Services as well as a Statistical Geneticist. Bryce joined GHI in 2009 from the University of Utah where he earned his PhD in Genetic Epidemiology and Biomedical Informatics. Before undertaking his graduate studies, Bryce worked for 2 years as a data analyst at Mayo Clinic in the Division of Biostatistics.